Not to contribute to gender stereotypes . . . but yeah, this is totally true. So do they/them/zie/hir or any other pronoun used by folks outside the gender binary. 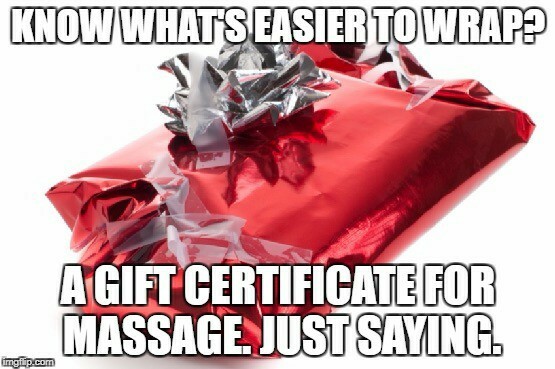 In short, massage gift certificates are for EVERYONE and EVERY BODY. They're easy to wrap, contain zero calories, and are AVAILABLE ONLINE any time of day or night. You can get them by dollar amount or by service. If you plan ahead, you can even get pretty paper ones from our office. 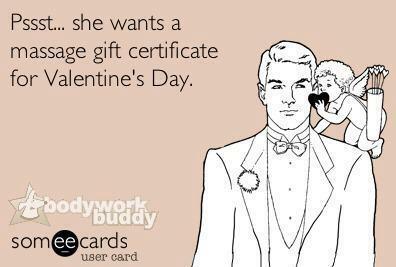 Be a hero twice - once when they receive the gift certificate, and again when they redeem it. What if you know what you want but your Dearest Heart needs a clue? We gotcha covered with our handy, helpful "Hint, Hint!" card. Print this sucker out, check the appropriate heart-shaped box (yes, that was totally a Nirvana reference), and do something unsubtle like tape it to the bathroom mirror. We've even included one below in order to make it easy for you. Want to learn more about the services listed? We've got a guide to our sweet Valentine specials. Even Cupid would be envious.